Pair the Signorello family's love of wine with their love of food, and this small place is excellent. 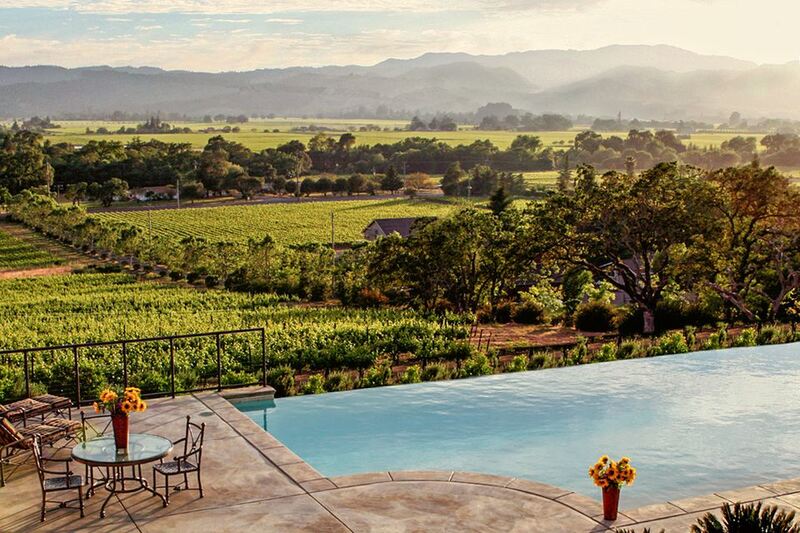 Add the view, and it becomes one of the most enjoyable wineries you'll find in all of Napa Valley. Signorello Estate’s winery was destroyed in the October 2017 wildfires. Signorello plans to fully rebuild, and an interim space will serve as Signorello’s home for the next three years as the winery is being rebuilt. Signorello Estate sits just a few hundred feet above Silverado Trail, just high enough to get out of the busy Napa Valley and allowing excellent views. Signorello wines are great, but their food and wine pairings are the reason to visit - and they're some of the best we've experienced. Wine should be enjoyed with food, and at Signorello, they intend to show you just how great that pairing can be. Don't settle for a simple wine tasting here. Instead, choose from one of several food and wine experiences. The Enoteca Signorello experience is their pièce de résistance: a 1.5-hour dining and tasting delight served outside on the patio or indoors in an intimate dining room. For some courses, Signorello partners with Snake River Farms, the American producers of Kobe-style Wagyu beef, which pairs especially well with Signorello's Bordeaux-style Cabernets. You will fall in love with Signorello just because of their view. They're just a short drive from Silverado Trail, but high enough on the hill to give a panoramic view of the Napa Valley. Signorello's Enoteca experience is a foodie favorite, and very reasonably priced compared to similar offerings at other Napa wineries. In fact, it's so good that the Women Fashionista Mary Orlin wrote about it in the Huffington Post, saying that one of Napa's best dining experiences isn't at a restaurant, but at a winery. Signorello wines have earned ratings as high as 97 from the Wine Enthusiast, ranking among that organization's top 100 wines of the year. The San Francisco Chronicle called them a Star of 2008 and their wines have only gotten better since then. Most online reviewers give Signorello excellent ratings. They talk about the patio and views and the food pairings and say the wines are excellent. You can also read visitor reviews of Signorello at Yelp. Because of local regulations, you need a reservation to visit Signorello. Reserving ahead is a good idea, but you may be able to get them the day of your visit. You can make reservations online at their website. All of Signorello's wines are estate grown on 67 acres around the winery. They produce about 7,000 cases of wine per year. They are in the in the Oak Knoll wine-growing area near Napa and right next to the famous Stag's Leap District. As is common in the travel industry, the writer was provided with a complimentary tour for the purpose of reviewing Signorello Estate. While it has not influenced this review, TripSavvy.com believes in full disclosure of all potential conflicts of interest.